I was in my relatives place in Indiranagar last week. The children wanted to eat chats so we drove towards 100 feet road in Indiranagar. I had my favourite pani-puri and that was the worst thing I ever ate in that area. My tastes buds were angry and I had to cool them quickly with something delicious and spicy food. I started scanning the area in search of a good food stall and noticed two of them just a few steps ahead of the ill-fated pani-puri center. 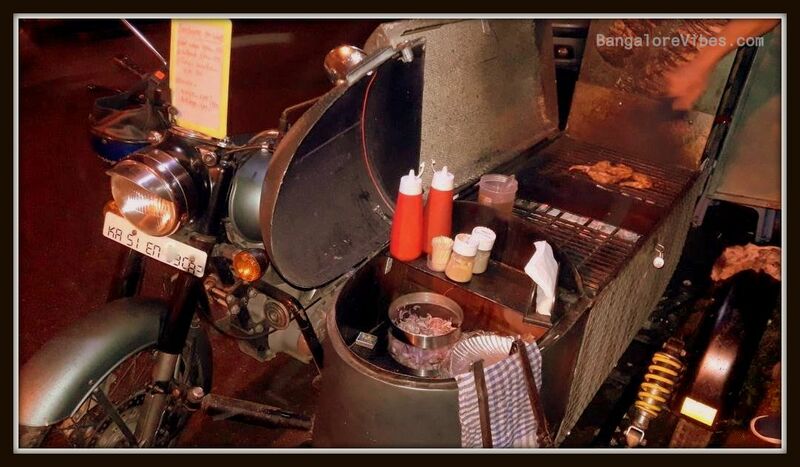 Like any other people on the street, I was attracted to the Barbecue on Wheels, thanks to the Royal Enfield motorcycle. However, I approached the pushcart fellow first. He was selling chicken sausage based hotdog at Rs. 120/- each. Not a good idea, I opted for plan-A. The Barbecue on Wheels offered just three varieties of grilled chicken – hot wings, lollipop and the Indian boneless at Rs. 110/- each. The menu is more for a compact grill. Two people managed the show and one of them was the owner. I ordered for chicken wings. While it was cooking, I started capturing photographs through my smartphone. The owner became curious and within moments, we were conversing. Sujith is from Tirupati. He was working for a popular airliner in a catering department at the Bengaluru International Airport. He quit the job to start the Barbeque on Wheels. He spent somewhere between two to three lakh rupees to assemble the compact grill (side car) with the Royal Enfield motorcycle. Sujith is a best example for chasing one’s dream. He quit his stable job to start a food business on the streets. I am not trying to be disparaging here but do appreciate his guts. Many are of the opinion that street food business is for those who are less educated and with limited skills. It is not the case now. However, it is not easy going. My order was ready in ten minutes. You will be waiting to know how the chicken wings was. That is a secret, I am not going to reveal it here, go and try yourself. For sure, the children enjoyed the barbeque chicken wings. Thanks to the unusual Bengaluru weather and not so good pani-puri! No outlets in Indiranagar will offer you four pieces of delicious, juicy and tasty grilled chicken wings for Rs. 110/- per plate, GST inclusive (I guess so). If one would miss the comfort of a posh restaurant in Indiranagar, why not bring the tables, chairs and air-conditioners to the footpath and replicate the classy open-air restaurants. Just Kidding. Sujith introduced his father to me, who was standing on the pavement watching his son selling the barbeque chicken. He worked for Reliance Communication in his hometown. We discussed about his sons business, his work and many other things. I appreciated him for allowing his son to pursue his dreams. There is no age limit to take risk when it comes to starting a business but it does play a major role. Youngsters will have ample time to learn and set things right. 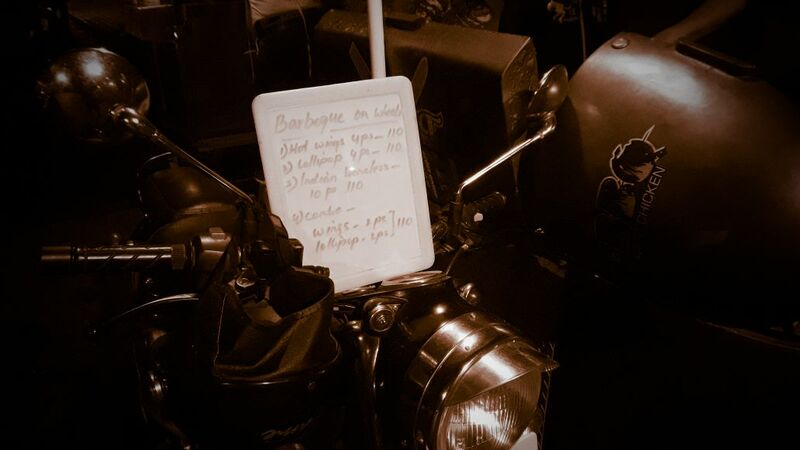 Barbeque on Royal Enfield is a new trend. Just a few months ago, I saw one in the Kammanahalli main road. I am not sure if they are still there. 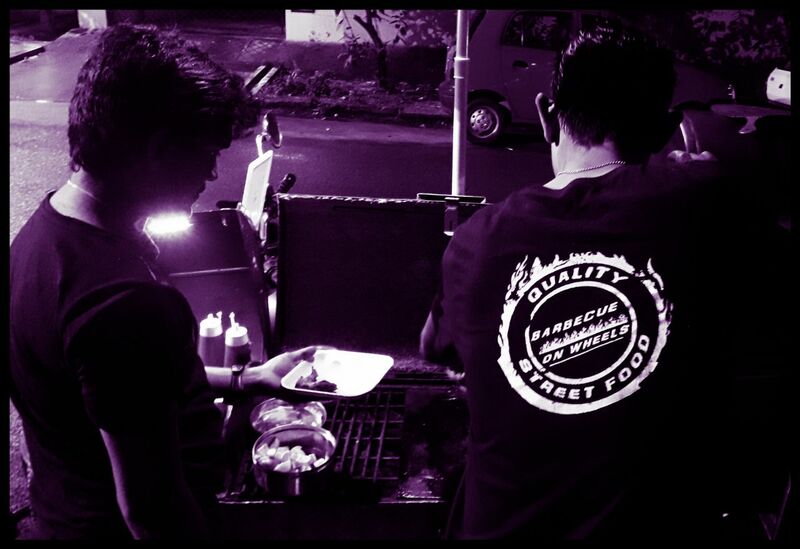 The Barbeque on Wheels in Indiranagar is new to the locality and is sure to attract customers. Challenges are something we all face on a daily basis. Be it personal or business. This business is not an exception. They may face issues in terms of capacity, permissions, food safety norms etc. However, problems are temporary and we all know the solutions. The hotdog vendor next to the Barbeque on Wheels did do some selling’s. I remember eating a delicious chicken hotdog from a roadside stall (Smokin Hot) in Kammanahalli main road. It was not a sausage based but a minced chicken rolled into a popular shape, painstakingly grilled, and delicately placed in the cavity of the hotdog bun along with some secret ingredients.